The average cost of memory care in Charleston County is $5,408 per month. This is higher than the national median of $4,650. To help you with your search, browse the 15 reviews below for memory care facilities in Charleston County. On average, consumers rate memory care in Charleston County 4.3 out of 5 stars. Caring.com has helped 10 families in Charleston County find high-quality senior care. To speak with one of our Family Advisors about memory care options and costs in Charleston County, call (855) 863-8283. Charleston County, South Carolina, has a population of 401,438 people, with 15.8 percent of residents aged 65 and older. Nine memory care facilities around Charleston County provide services for the state’s 89,000 people diagnosed with Alzheimer’s and other types of dementia. Facilities offering memory care are Community Residential Care Facilities (CRCFs), while some may also be classified as Alzheimer’s Special Care Units (SCUs) that offer specialized care and assistance with basic daily needs. Considered the primary medical hub for eastern South Carolina, Charleston County is home to the Medical University of South Carolina Medical Center (MUSC). MUSC Medical Center offers a Memory Disorders Clinic for advanced treatment of residents diagnosed with Alzheimer’s disease, vascular dementia, dementia with Lewy bodies, Huntington’s disease and Parkinson’s disease. Winters in Charleston County are pleasant, with January lows averaging 40 degrees F, and summers are temperate, with July highs averaging 89 degrees F. It is a good idea to check how facilities keep residents comfortable in the event of temperature extremes. Charleston County ranks 51.7 out of 100 (with 100 being the safest) when it comes to the crime rate, which makes it roughly 13 points higher than the national average. Memory care facilities typically take precautions to safeguard residents, but it’s always good to check with each prospective facility to determine what precautions are in place to protect loved ones. Seniors with breathing problems can take comfort in the air quality in Charleston County. The American Lung Association has given the air here a passing grade. 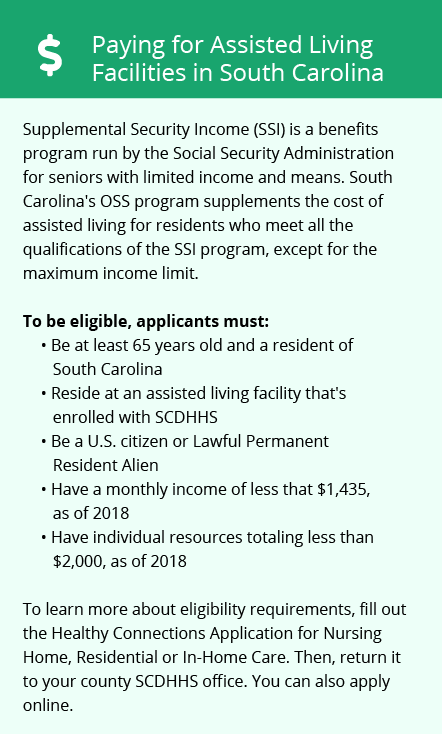 Seniors in South Carolina pay no tax on their Social Security retirement income benefits. A $15,000 deduction is available for seniors receiving other forms of retirement. Memory Care costs in Charleston County start around $5,265 per month on average, while the nationwide average cost of memory care is $4,799 per month. It’s important to note that memory care rates in Charleston County and the surrounding suburbs can vary widely based on factors such as location, the level of care needed, apartment size and the types of amenities offered at each community. Charleston County and the surrounding area are home to numerous government agencies and non-profit organizations offering help for seniors searching for or currently residing in an assisted living community. These organizations can also provide assistance in a number of other eldercare services such as geriatric care management, elder law advice, estate planning, finding home care and health and wellness programs. To see a list of free memory care resources in Charleston County, please visit our Assisted Living in South Carolina page. 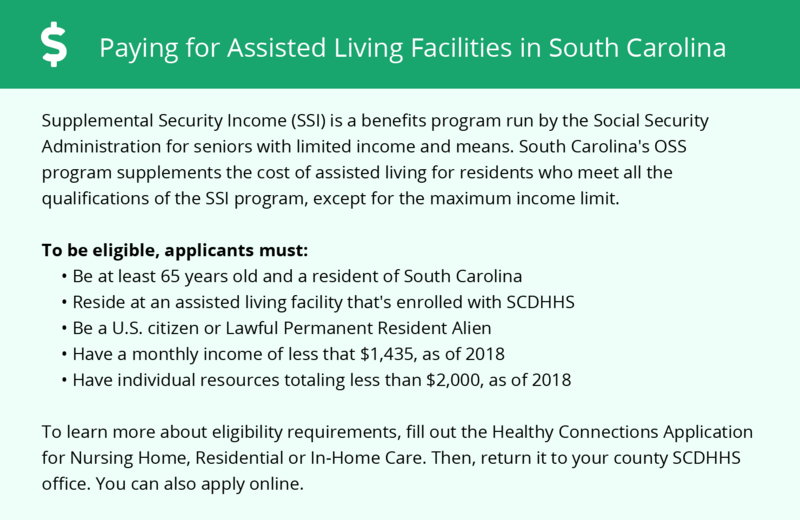 Charleston County-area assisted living communities must adhere to the comprehensive set of state laws and regulations that all assisted living communities in South Carolina are required to follow. Visit our Memory Care in South Carolina page for more information about these laws.